“Flood” is a British thriller that might hit a little too close to home for many American audiences. Memories of Hurricane Katrina are probably still too fresh for many audiences (particularly in the southeast part of the states) for the film to really be very exciting. It sounds a bit like your standard disaster movie… a huge tidal wave is coming, millions of lives are at stake, it’s up to one man to save everybody, etc. and so on. I don’t know whether the film is aiming at being a tragic drama or an adrenaline-pumping action flick, but from the sound of Debbie Wiseman’s score it seems to be both. The opening title piece starts the album with a very moving theme that captures the human emotions of the story. It has a somewhat mournful, lyrical quality, and the vocals of Hayley Westenra really add a lot to the piece. Some of you may remember Westenra from her work on James Horner’s score for “The New World”… if the liner notes of this album are any indication, Westenra may well be the next Lisa Gerrard of the film music world. She’s done two other projects with Wiseman, and she apparently has a couple more score projects in the works. She has a wonderful voice, I’m glad to hear more of her. The other side of the score is introduced in the second track, an almost Goldsmith-like action motif pumped up by some slick electronic percussion. Wiseman blends the electronics and the orchestra very well, and it was a bit of a surprise to hear, as Wiseman is generally a more traditional composer who avoids synthetic elements. The brassy, aggressive action music shows up quite a lot, and is relentless in it’s purpose, much like the tidal wave in the film. Wiseman offers a reasonable amount of variation to the action music, but other reviews have understandably complained about the level of repetition in the music. Wiseman probably could have shaved a good 15 minutes off the album to make a stronger listening experience. Even so, the core material here is excellent, and Wiseman continue demonstrate (as Shirley Walker did before her) that women are capable of writing more than just fluffy romantic scores for period films (though Wiseman can certainly write one of those remarkably well, too). 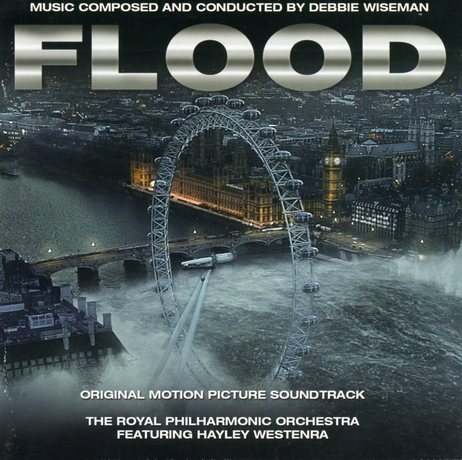 “Flood” is not nearly as accomplished as Wiseman’s stunning score for “Arsene Lupin” a couple of years ago, but it’s an album that is alternately exciting and moving, and the themes are among the more memorable musical ideas I’ve heard this year. Another solid effort from a composer who really needs more exposure to the mainstream film music world. Music composed and conducted by Debbie Wiseman. Performed by The Royal Philharmonic Orchestra. Orchestrations by Debbie Wiseman. Special vocal performances by Hayley Westenra. Recorded and mixed by Steve Price. Album produced by Debbie Wiseman.